As the majority of low voltage supplies to both new and existing electrical installations are connected to a PME earthing terminal, this article discusses the operating characteristics of this particular supply arrangement which in its entirety is known as a TN-C-S system. 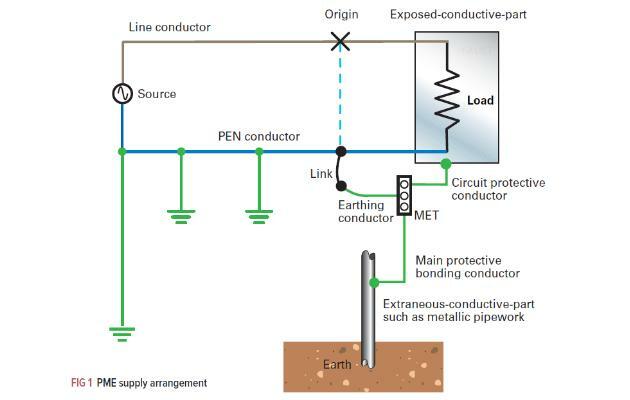 As shown in Fig 1, in a PME arrangement the supply neutral conductor provides the functions of both protective and neutral conductors, and is connected to multiple earthing points on the supply network. The supply neutral conductor, often referred to as a PEN (combined protective and neutral) or CNE (combined neutral and earth) conductor, is terminated at the distributor’s switchgear (cut-out) where connection of the earthing conductor to the supply neutral is achieved by means of an internal link provided by the distributor. The use of a combined conductor applies only to the supply and not to the consumer’s installation. Therefore, except for the circumstances permitted by Regulation 543.4.2 separate neutral and earth conductors must be used within the consumer’s installation (Regulation 543.4.1 refers). Because the supply neutral is bonded to earth in a PME system, the fault return path for both line to earth and line to neutral faults is via the combined conductor. The advantage of using the combined conductor in this way is that it provides a low impedance return path which ensures rapid disconnection of the supply under fault conditions. For a TN-C-S system, supply distributors’ specify a maximum external fault loop impedance Ze of 0.35 Ω. Where PME conditions apply, the returning current has two possible paths, through the combined conductor and the general mass of Earth. Depending on their relative impedances some current, referred to as diverted or circulating neutral current, may return via the general mass of Earth. In hazardous locations, such as petrol forecourts, this may present a risk of ignition or explosion, so PME is not permitted in such locations. Some other considerations relating to PME supplies are as follows. 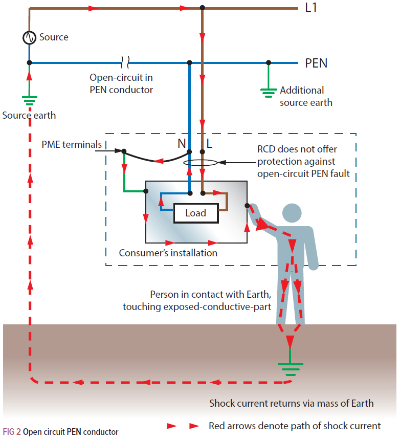 Under normal conditions, a small voltage difference may exist between the PME earthing terminal at the origin of an installation and the general mass of Earth, depending on the distribution network configuration and loading. This small voltage above Earth potential could, under certain conditions, create the possibility of ‘perceived shock’ for a person simultaneously in contact with an exposed-conductive-part or an extraneous-conductive-part and ‘Earth potential’. Especially, in a location where there is a reduced body resistance due to the presence of water, such as the shower area within a sports facility. As shown in Fig 2, an open-circuit in the PEN conductor within the network can cause the combined neutral/earth terminal at the cut-out in consumer’s premises to rise above earth potential, due to carrying load currents from installations downstream from the open circuit. Consequently, the protective conductors connected at that terminal are also likely to rise in potential; meaning any metallic parts, such as gas pipework connected in the consumers’ installation is also likely to rise above earth potential, creating a risk of electric shock to any person in simultaneous contact with such parts and the general mass of Earth. For these reasons, where a PME earthing terminal is provided, its use may be inadvisable in some premises and prohibited in certain others. For example, Regulation 9(4) of the Electricity Safety Quality and Continuity Regulations 2002 (as amended) prohibits the connection of a combined neutral and protective conductor to any metalwork in a caravan or boat. 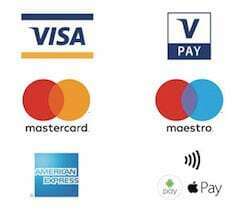 Connection to a PME terminal is permitted for the fixed buildings of these locations, such as offices, restaurants or shops, but it must not be used for the caravan or boat mooring supplies. To minimise the risks associated with PME, the combined conductor is earthed at multiple points along the network and bonding is provided, in accordance with BS 7671, within the consumer’s installation. Due to the low earth loop impedance path, there is a potential for higher fault currents to flow in a PME system, therefore the main protective bonding conductors must be sized in accordance with the neutral conductor of the supply and Table 54.8 of BS 7671, Table 1 refers. Where the PME supply is extended to a detached outbuilding such as, for example, from a house to a detached garage, these bonding requirements will also need to be applied to any extraneous-conductive-parts in the garage. Given such circumstances, it is advisable to use a separate (TT) earthing arrangement for the installation in the detached building. Even though the distributor may have provided a PME earthing facility, it is the responsibility of the electrical installation designer to assess its suitability and adequacy, and where necessary an alternative means of earthing, such as a TT system, may need to be used.